Global map of the predicted distribution of Ae. aegypti. The map depicts the probability of occurrence (from 0 blue to 1 red) at a spatial resolution of 5 km × 5 km. Effect plots of covariates used in this study showing the marginal effect of each covariate on probability of presence for Ae. aegypti (1) and Ae. 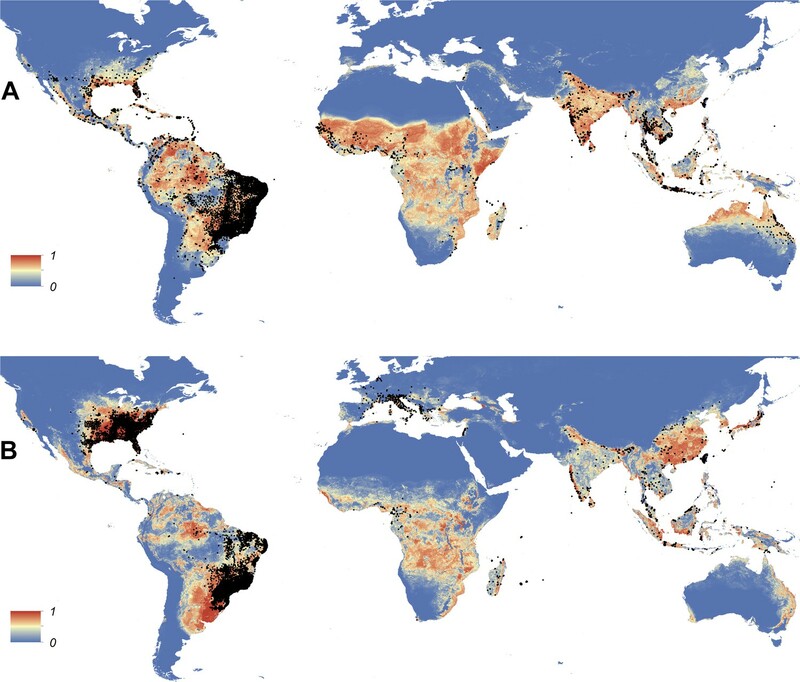 albopictus (2): enhanced vegetation index (EVI) annual mean (A); Enhanced vegetation index—range (B); annual monthly maximum precipitation (C); annual monthly minimum precipitation (D); temperature suitability (E); urban areas (F); peri-urban areas (G). Set of covariate layers used to predict the ecological niche of Ae. aegypti and Ae. 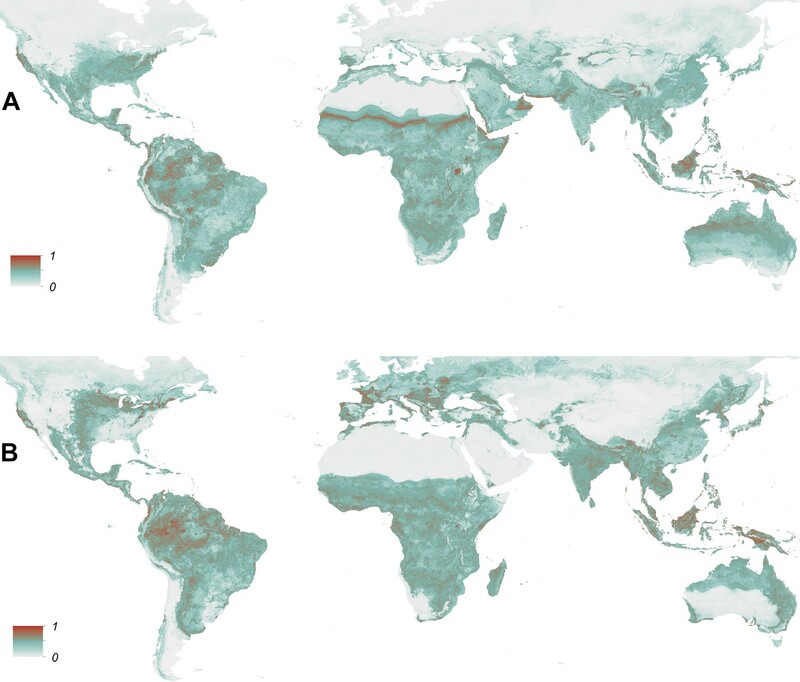 albopictus described in detail in the ‘Materials and methods’ section; (A) enhanced vegetation index (EVI) annual mean, (B) EVI annual range, (C) annual monthly maximum precipitation, (D) annual monthly minimum precipitation, (E) temperature suitability for Ae. albopictus, (F) temperature suitability for Ae. aegypti, (G) rural, peri-urban and urban classification layer. Visualization of pixel level uncertainty calculated using the upper and lower bounds of the 95% confidence intervals associated with the prediction maps for Ae. aegypti (A) and Ae. albopictus (B). The distribution of the occurrence database for Ae. aegypti (A) and Ae. albopictus (B) plotted on the underlying prediction surface. Global map of the predicted distribution of Ae. albopictus. Predicted probability of occurrence of Ae. albopictus in Europe (A) and the United States (B), regions in which Ae. albopictus is rapidly expanding its range. Points represent known occurrences (transient [triangles] or established [circles]) until the end of 2013. Top 10 countries in terms of occurrence records for each continent are shown for Ae. aegypti (a) and Ae. albopictus (b). List of contributors and their affiliation from TigerMaps & VBORNET for Ae. albopictus presence records in Europe.